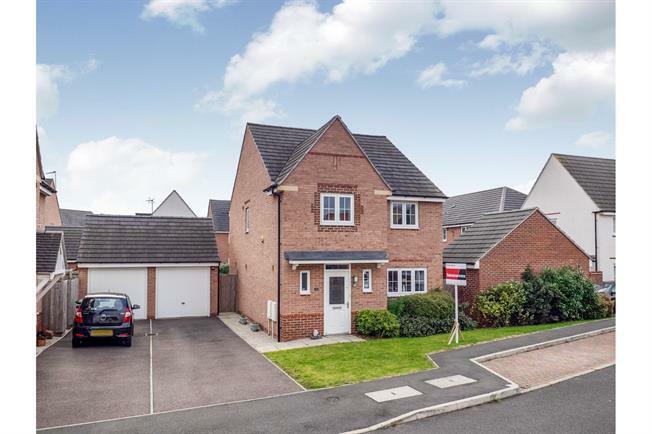 4 Bedroom Detached House For Sale in Nottingham for Asking Price £325,000. This fantastic four bedroom detached property is the perfect family home. Benefiting from a large reception room, spacious kitchen-diner with French doors leading to the rear garden, downstairs WC, Four bedrooms with en-suite to master bedroom, family bathroom and boarded loft space. Outside the property benefits from a driveway for two cars, detached garage and mid-sized south facing rear garden with patio areas. Call Bairstow eves, Beeston to arrange viewings on 0115 943 1072. Double glazed UPVC window. Radiator. Access from Hallway. UPVC French double glazed door, opening onto the patio. Double glazed uPVC window. Radiator. Roll top work surface, fitted units, one and a half bowl sink with drainer, electric oven, gas hob, over hob extractor. Standard WC and pedestal sink. Power Shower, Pedestal sink, WC and extractor fan and shaving point. UPVC double glazed frosted window. Double glazed UPVC window with frosted glass. Heated towel rail, laminate flooring. Standard WC, panelled bath, shower over bath, pedestal sink, extractor fan.